The new outdoor outlets. 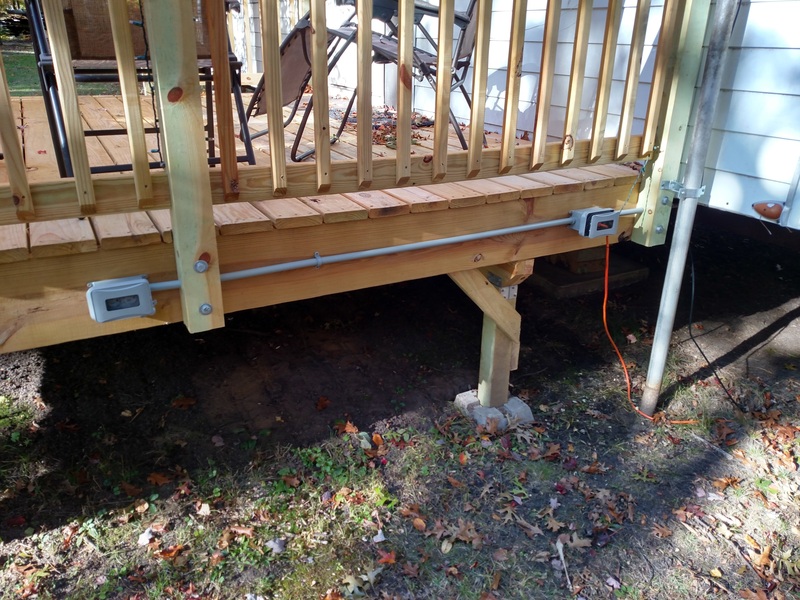 The left pair is always live and each outlet on the right is controlled by a switch inside the trailer to power the deck and outhouse lights respectively. Arrived a little before 5:00 pm with Lyssa. My folks have the boys so we can go out for our anniversary this weekend. We’ve got reservations at Grey Rock in Green Lake, so we’re staying here for the night. 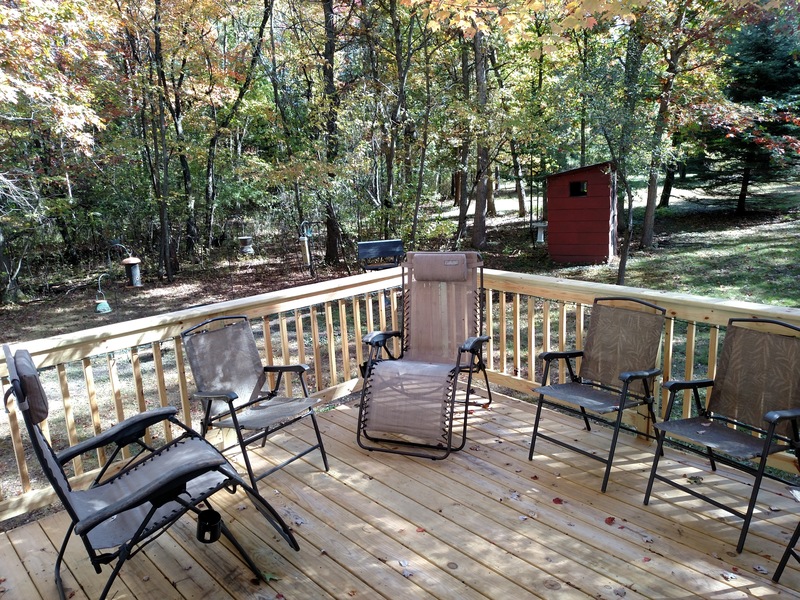 The fall colors are just starting to creep in; lots of yellow leaves toward the south end of the property and the maple over the deck is already bright red. Lyssa remarked right away upon opening the trailer how nice and “homey” things are getting around here. The place looks (and smells!) pretty great. With our reservations at 7:15, there was just enough time to finish a small project before we left for dinner. 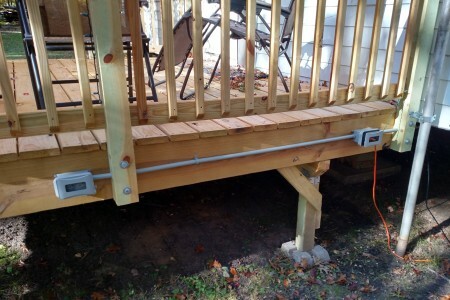 I started securing the deck lights to the railings. I also brought up and set out four more deck chairs that I had picked up on Craigslist. Before the sun even started setting, I heard a pair of owls start calling from across the road. Seemed pretty early for them to be up and about. A little after 6:30, I washed up, changed clothes, and we headed to Grey Rock. Dinner was excellent as usual; I had a bison steak with a bourbon glaze. Never had bison before. It’s delicious. And thanks to a mix-up with our drinks as we waited for our table (which really wasn’t that big of a deal), our appetizers and drinks were on the house. Stuffed, we made it back to the trailer around 9:30. I had left the deck lights on when we left for dinner and it looked really warm and inviting when we pulled in. I have to give credit to Sean for pitching the idea of a deck up here. 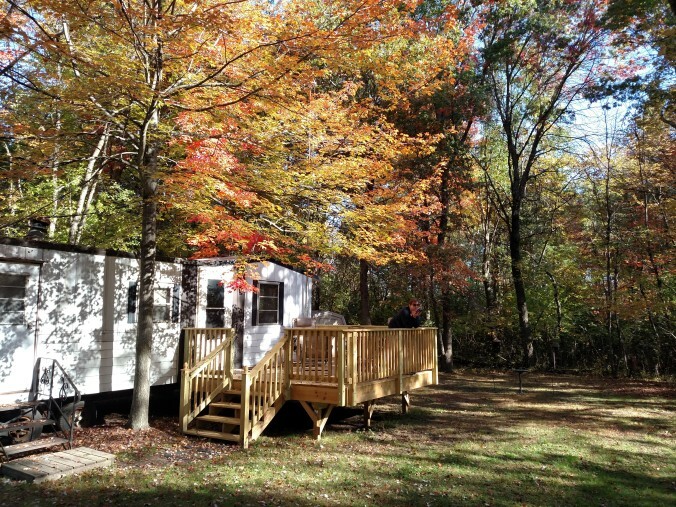 It makes such a difference in dressing up the place and certainly motivated me to make all of the other trailer improvements this summer like the kitchen remodel, trundle bed, and new front door. Last year at this time, I wouldn’t have imagined Lyssa and I could just stop up for a night and enjoy it here without putting in a lot of prep work or enduring some less-than-ideal conditions. Now we can just settle in for the night and relax. 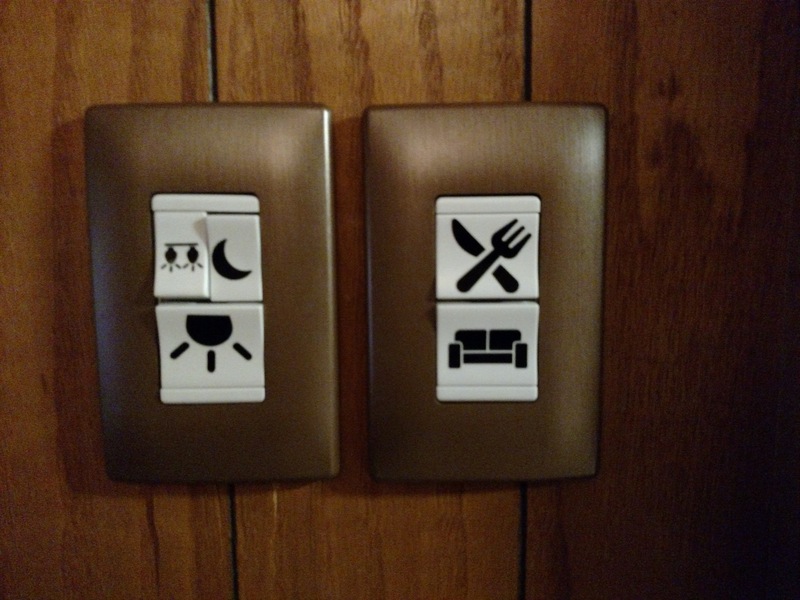 One of the things I brought up this trip was a set of labels I had printed up for the new light switches by the front door. I have a running barter agreement with a print shop in Oshkosh: I provide IT support and they take care of whatever I need from photos to vinyl. I found some simple line art pictograms online to represent the switch functions and sent them off to the print shop to get cut into black vinyl decals. 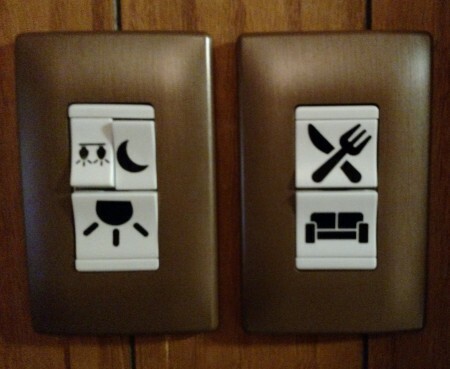 I think they add a nice touch. We watched some TV for a bit and were in bed by 11:00. Warmer than I had expected; we didn’t even have to haul out the quartz heater. Both of us were up around 7:00 but in no real hurry to get out of bed. It’s supposed to get unseasonably warm today with highs in the upper 70s and it’s already comfortable enough to be outside in a t-shirt. We left the trailer around 9:00 for the requisite Aunt Judy’s breakfast where we each enjoyed my usual. Once we got back, Lyssa caught up on some reading for work while I scratched a few more items off my project list. 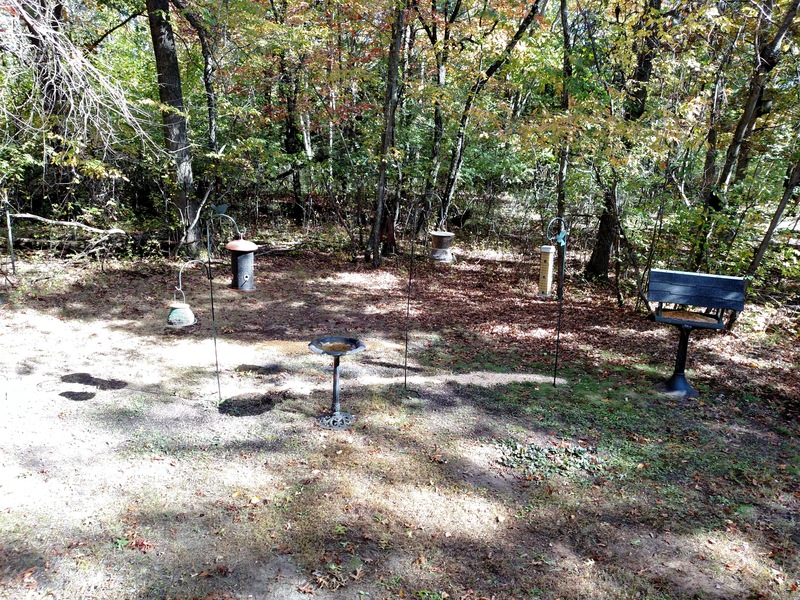 My bird feeders were picked clean, so I filled them back up and even brought over a few more from around the other trailer. The 50-pound bag of sunflower seed I bought earlier this summer is already gone, so I’ll have to grab some more before my next trip up. The chickadees were pretty anxious to get the feeders filled and we almost got them to eat right out of our hands. I’m hoping that having full feeders again will bring back the goldfinches. We used to have tons of them up here but I haven’t seen one in the yard in years. I noticed several turkey feathers on the ground where I had spread some corn out, so I put another 5-gallon pail’s worth back down as well. Last week, back in Oshkosh, I went through and thoroughly cleaned both of the Ruger .22 rifles, the Savage .22/20ga over/under, and both revolvers. I brought those all back up to test fire them and sight in the scopes on the rifles. Lyssa got in some practice on the .22 revolver, too. Everything seems to be in order, and it’s nice seeing everything all shined up and spotless. They were all overdue for cleaning, especially the rifles. Years spent in a gun cabinet with no climate control were not kind. Going forward, I’m planning to keep them all stored in their hard travel cases with several bags of dessicant. Dad had dropped off a mineral block in the pole barn when he brought up his boat last week, so I ran it out by his stand for him and made a quick run of the marsh trails. The grass is pretty dry out there and ready to get cut, so I’ll have to fire up the old Craftsman mower next time I’m up. Lyssa stripped the bed and packed up the linens and towels while I buttoned everything up outside and put my tools away. We’re meeting my folks and the boys at Waldvogels today and having dinner in Mayville. We made our way out of the driveway around 12:15.